The 2010 US Open champion is €443,725 behind Stenson and playing just one of the two remaining events following this week’s WGC in Shanghai in the battle to become European No 1. “Dustin, obviously great frontrunner, doing what he needed to do today,” McDowell said before the American drove into water and racked up a double bogey seven at the last to card a 66 and see his commanding lead cut to just three shots from Poulter, who birdied the last for a 63 on a day of low scoring. McDowell holed a bunker shot for an eagle two at there 16th for a bogey-free 64 that would be a score worth repeating on Sunday. Rory McIlroy birdied the last two holes for a 67 to go into the final day tied for fourth with Graham DeLaet and Justin Rose on 12 under, six shots behind Johnson. Johnson looked set to retain his five-stroke overnight lead before his double at the last and if McDowell finds some form with the putter, he could be very dangerous indeed. He overhauled Johnson to win the 2010 US Open at Pebble Beach and knows that a good putting performance will give him a chance. 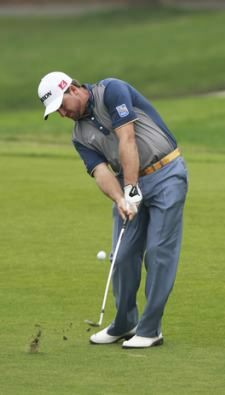 “Bizarrely, I really haven’t got it going on the greens yet this week,” McDowell said. “I made a couple today, a bit of a bonus with the bunker shot on 16. 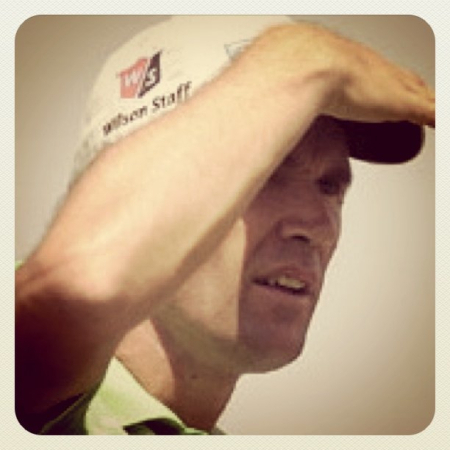 I haven’t holed a lot of putts, though, so hopefully I’m saving it for tomorrow…. “I had two putts on the last two holes, which could have gone in, but you know, that’s golf, and really had a lot of fun today. I hit the ball really well today. Looking forward to tomorrow. “I knew it was going to be low scoring today. We got off to a nice start, I said to [caddie] Kenny [Comboy], we’ve just got to keep the pedal down here, everyone is going to be going low. Johnson started the day with a five-shot advantage following a course record 63 on Friday and that margin was intact when he headed to the par five 18th hole after ten birdies in his opening 17 holes. However, the big-hitting American found the water on the last and carded his second double bogey of the day, after twice failing to chip onto the green on the par fourth tenth hole, where he signed for a six. That meant a round of 66 and an 18 under par total of 198 for the US Ryder Cup player, who will now take a three-stroke lead over Poulter into the final round, with 2010 US Open Champion McDowell a further shot back. “I’m still a little mad from my double bogey on 18,” said Johnson. “But to have a three shot lead going into the last day is good, and I’m looking forward to the challenge. On a day of low scoring in China, defending champion Poulter fired a superb nine under par 63, which included five birdies in row from the third hole and an eagle three on the 14th, as he surged to 15 under par and firmly into contention to become only the second player after Tiger Woods to retain a World Golf Championships title. “Nine under par on any golf course is a good score, and that was a good nine under par,” said Poulter. “I guess the only blemish for me, which leaves a bit of a sour taste, was three‑putting 17, and actually missing a couple of opportunities. McDowell will also be looking to put pressure on Johnson in the final round after posting six birdies in his opening 14 holes and then chipping in from the greenside bunker for an eagle on the 16th hole in his flawless eight under par round of 64. Former world No 1 Rory McIlroy followed an early birdie at the third with a bogey at the par-three fourth but got that shot back at the next before storming home in 32 with birdies at the 10th, 14th and the last two holes. 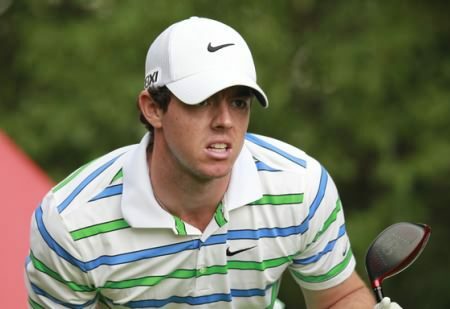 Assessing his chances, McIlroy added: “I need to get off to a faster start. The last couple of days, I’ve sort of been even par through four or five holes, and really need to be 2-or 3-under to give yourself a kick-start because you’ve got two good chances on 7 and 8 to make birdies there, and you know, you see guys at 4-or 5-under par and then you have some chances on the back nine, as well. “There’s definitely a low score out there. You just need to take advantage of the holes that you really should be birdieing. Germany’s Martin Kaymer eight shots off the lead, tied with Bubba Watson and Boo Weekley on ten under par, after surging up the leaderboard with a magnificent course record 62. 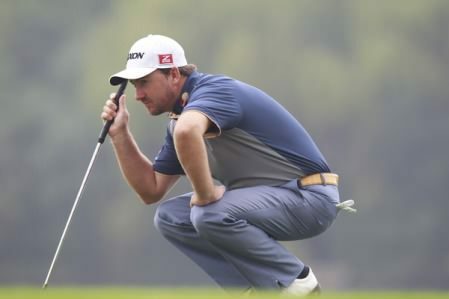 Graeme McDowell wielded his putter like a wand to fire a second consecutive round of 67 for a a three shot lead over Ryder Cup team-mate Ian Poulter in the WGC-HSBC Champions. Padraig Harrington carded the first albatross of his career and added three birdies yet still failed to break 70 in the third round of the WGC-HSBC Champions. Despite his spectacular two at the 594-yard, par-five 14th, the world No 19 is eight shots behind leader Francesco Molinari entering the final round in Shanghai and out of the running for his second tournament win on the trot.